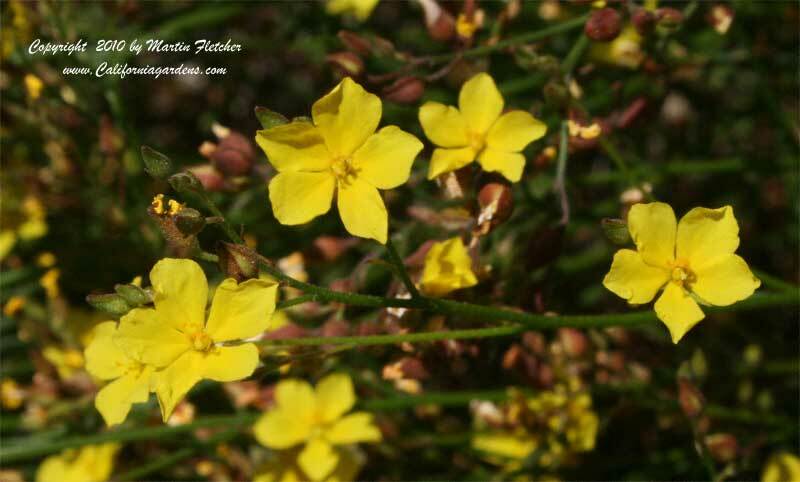 Helianthemum scoparium is native to the Coastal Ranges of California. The Sun Rose can often be found in disturbed trailside locations, fire breaks and road cuts. Helianthemum scoparium grows to 18" tall and wide. Helianthemum scoparium grows in a variety of soils, but always in an exposed location. The foliage is Summer deciduous, helping the plants withstand the Summer heat and giving some seasonal variation when the naked stems redden up from the heat. Helianthemum scoparium blooms in early to mid Spring. Yellow flowers of Helianthemum scoparium - Sunrose or Peak Rushrose. High resolution photos are part of our garden image collection.